My parents began buying these REMCO kits for me starting at 8 years old. I loved them. I must have built just about every one made (at least 12 of them). They helped bring me to my career as an Electro-Mechanical engineer. I would like to see that list. Also, I would like to find Science Kit transmitter. 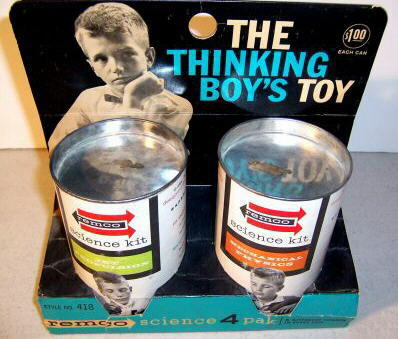 Notice they stereotype "the thinking boy" (later "nerd") with a bow-tie. Oh Yeah!!! And thanx for the memories (I'd forgotten these)...with these toys you actually learned something useful....also the Erector sets!!! and the Chemistry sets...if kids had chemistry sets today, DHS would casll out the SWAT teams on them...and their parents!!! Thanks, I look at that. Mike - Wikipedia's Remco entry has a nice list. Have you looked there? Does anyone have a list of Remco toys that were produced? How about a list of the science kits? I am especially interested in the science kit transmitter.